The authors review 4 important areasthat must be addressed when considering the humeral component in reverse shoulder arthroplasty: proximal humeral bony deformity, bone loss, methods of fixation, and implant design. The glenoid component in reverse shoulder arthroplasty (RSA) has received a great deal of attention, as orthopaedic surgeons have sought to decrease the incidence of postoperative complications. Less attention has been focused on the humeral side, although it is certainly deserving of important consideration: It is an essential component of the procedure and can, at times, be more challenging than the glenoid side. Deformity of the proximal humerus can be addressed very well with RSA, especially in the context of posttraumatic arthritis, with or without previous fracture fixation. Importantly, there must also be sufficient alignment present in the humeral intramedullary canal to be able to insert the humeral component. In addition, the degree of deformity encountered in posttraumatic arthritis (Figures 1a-b), as well as the deformity following internal fixation of the proximal humeral fracture with osteonecrosis (Figures 2a-b), can be quite variable. Figure 1a. Posttraumatic glenohumeral osteoarthritis with deformity of the proximal humerus. Figure 1b. Posttraumatic glenohumeral osteoarthritis with deformity of the proximal humerus. Figure 2a. 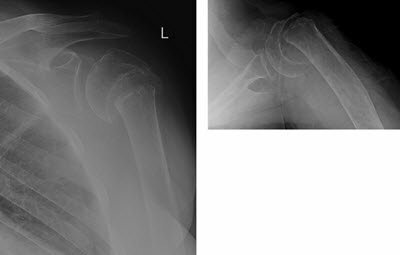 Posttraumatic deformity with secondary osteonecrosis and posttraumatic arthritis of glenohumeral joint after internal fixation. Figure 2b. 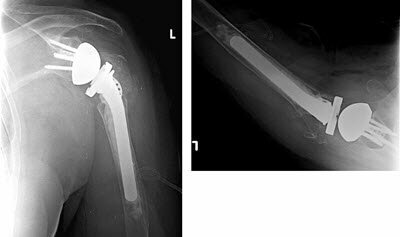 Removal of hardware and reverse arthroplasty for posttraumatic glenohumeral arthritis. In cases of deformity complicated by proximal humerus non-union (Figures 3a-b) and/or osteopenia, RSA with osteotomy can be performed with reattachment of the tuberosities, particularly the posterior portion of the greater tuberosity. Figure 3a. Non-union proximal humerus fracture. Figure 3b. Non-union proximal humerus fracture – arthroplasty. Proper preoperative evaluation to understand the anatomy of the deformity so appropriate planning can be performed. When a greater tuberosity osteotomy is necessary, every effort should be made to maintain or reattach the posterior portion of the rotator cuff. This will maintain external rotation function and enhance the ability to perform basic activities of daily living. Displaced tuberosities may require removal to avoid mechanical impingement that can lead to postoperative dislocation. Deformity of the metaphyseal/diaphyseal junction or the shaft requires careful evaluation to determine if the alignment of the medullary canal will allow insertion of the humeral stem in an acceptable position. If this is not possible, an osteotomy will be necessary, with appropriate planning for the method of fixation. Bone loss of the proximal humerus is often encountered in revision cases, but it can also be an important consideration in cases in which RSA is used as the primary treatment method to manage proximal humerus fractures. Greiner et al  analyzed 50 cases in which RSA was used to treat proximal humerus fractures. They found that a metaphyseal bone defect of >3 cm and any preoperative degeneration of the teres minor were significant negative prognostic factors impacting outcomes, as measured by the Constant score at an average follow-up of 34 months. For this reason, significant metaphyseal bone loss may be an important factor to address in treating these fractures. As previously mentioned, the more common situation in which bone loss may be encountered is during the use of RSA for a revision procedure. Cuff et al  reported on the biomechanical ramifications of proximal humeral bone loss using a sawbones model. They observed an increased rate of rotational failure in the reverse humeral constructs when torquing forces were applied, compared with an intact proximal humerus. In particular, for cases of cemented fixation, the presence of bone in the proximal humerus significantly enhanced stability to the entire construct. 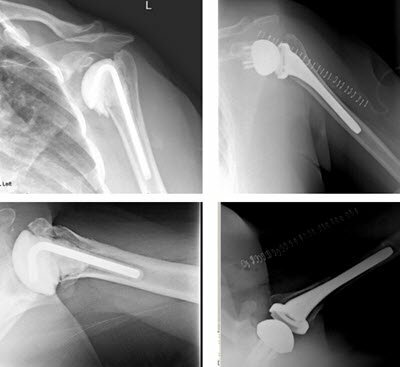 The authors noted that because the semi-constrained nature of the reverse implant transfers increased stresses onto the glenoid and humeral interfaces of the implant, addressing proximal humeral bone loss is important for optimizing stability when using RSA for revision, despite noting that glenoid-sided loosening is the more common mode of failure. Therefore, in planning for a revision shoulder arthroplasty, one must assess and be prepared to address proximal humeral bony deficiency, ranging from minimal bone loss to massive bony defects. Minimal bone loss may, in fact, be observed with relatively straightforward removal of previous stemmed implant. In these cases, impaction grafting may be used to facilitate a better fit of the new humeral stem, as reported in a case study by Halstead et al . Such may be the case when a hemiarthroplasty is revised to an RSA. The use of a platform stem can greatly facilitate this procedure by avoiding the necessity of removing the stem. This will become increasingly important as more and more RSAs are performed. Bone loss can be much more severe when an osteotomy is needed for stem removal or after revision for infection. Understanding the degree of bone loss is important in restoring length and lateral offset, which, in turn, is important for appropriate deltoid function. In general, the approach to bone loss has changed. Previously, it was thought that more extensive bone loss of the proximal humerus necessitated an allograft to restore proper tissue tensioning and the deltoid movement arm. (Figure 4) However, more recent information has shown that this is only necessary in more extreme cases. Figure 4. A sawbones model demonstrating how the proximal humeral allograft is secured to the humeral shaft with use of cables. Used with permission. Lateral offset can often be restored through the choice of implant. 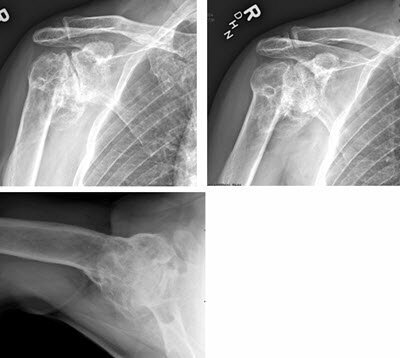 Budge et al  prospectively followed 15 patients with significant proximal humeral bone loss who were treated with RSA rather than an allograft bulk bone graft. They found 87% subjective satisfaction ratings at a minimum of 2-year follow-up. The average bone loss in their study group was 38.4 mm, with the largest defect measuring 72 mm. Despite this, they reported improvements in VAS pain scores, Constant scores, and range of motion postoperatively at final follow-up. Parallels may potentially be drawn from the tumor literature, where reconstruction of massive bone loss around the humerus is also encountered. Van de Sande et al  reported superior outcomes with the use of an endoprosthesis for proximal humeral reconstruction versus allograft-prosthesis composites. There were significantly fewer revisions and complications using the endoprosthesis, with improved implant survival at median follow-up of 17 years. Although much experience with RSA has been based on cement fixation of the humeral component, there is also literature supporting the success of cementless fixation. Wiater et al  reported on a comparison of cemented and cementless humeral stems in 101 patients undergoing RSA. They examined range of motion and functional outcomes at a minimum of 2 years and found no difference in clinical and radiographic outcomes. They noted several advantages of cementless humeral stems, including an easier revision and shorter operative time. The authors reported in a separate follow-up study  that even at 5 years, there were no differences in both clinical radiographic outcomes between the cementless and cemented humeral stem treatment groups and concluded that cementless fixation may offer several benefits over cemented fixation. Thus, there are recent data indicating that cementless insertion can be successful. This is particularly true when combined with metaphyseal impaction grafting when the bone quality is poor. Our approach has always been to utilize cementless fixation whenever possible, including in revision procedures (Figure 5). Figure 5. 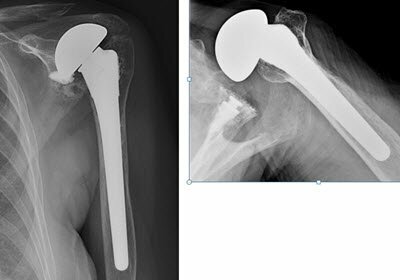 Revision shoulder arthroplasty to reverse prosthesis with cementless stem fixation. We have, in fact, become increasingly comfortable with cementless humeral components in RSA for all primary and many revision cases. In revisions, if cement fixation is necessary, we try to limit the cement to the metaphyseal region, even when long stem components are utilized (Figures 6a-b). We have concerns about the ability to remove cement from the humeral canal, particularly in the presence of osteopenic bone and thin humeral cortices. Figure 6a. Patient in need of revision to reverse prosthesis. Figure 6b. 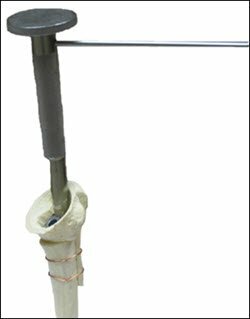 Revision to long-stem prosthesis with cementing restricted to proximal metaphyseal region. Therefore, we generally try not to use cement to avoid this problem if revision becomes necessary. If we must use cement, we use as little as possible to achieve secure fixation. The exception is RSA performed for proximal humeral fractures; in those cases, cement fixation is not only desirable, but also necessary to achieve the needed stability of the implant. With proximal humerus fractures, the loss of metaphyseal bone support compromises rotational and axial stability, thereby necessitating the use of cement. The design of the implant is also an important consideration in addressing the humeral side in RSA. Many currently available implants place the humeral component “into the humerus,” ie, with an “inset” position. Other implants place the humeral component “onto” the metaphysis, which provides a different level of humeral offset. Most discussions of implant design in RSA have focused on the glenoid component and the location of the center of rotation as medial (on the glenoid) or more lateral. It is important to recognize that this is only one component of offset. The design of the humeral component also impacts offset, with offset varying among the different system designs (Figure 7). Offset, in turn, impacts tensioning of the deltoid and the remaining portion of the rotator cuff. The ability to laterally offset the construct may also reduce the need for proximal humeral bone grafting. Figure 7. Varying offsets with different shoulder prosthetic designs. With the Grammont design, the glenoid center of rotation is at the surface of the glenoid. The humeral offset is about 9.8 mm. The Encore design results in a center of rotation that is 10 mm lateral to the glenoid surface and has a total offset of 10.9 mm. The Equinox design, with the humeral component placed “onto” the metaphysis, has a glenoid center of rotation 2 mm from the glenoid, but with a humeral offset of 20.8 mm. This may provide some benefits with respect to deltoid tensioning and rotator cuff function. Whether differences in offset will impact functional outcomes is unknown; more study is needed. In considering stem design, of special note is the evolution of fracture stems. Use of RSA to treat proximal humerus fractures in older patients, particularly those with displaced 3- or 4-part fractures, is a more recent expansion of the indications for the procedure. Some studies have reported improved range of motion after RSA for fracture, as compared with an open reduction internal fixation procedure or hemiarthroplasty, as well as cost savings to the entire medical system. This finding remains to be validated as other studies. A systematic review by Namdari et al  found equivalent outcomes with increased complication rates associated with RSA compared with hemiarthroplasty for proximal humerus fractures. 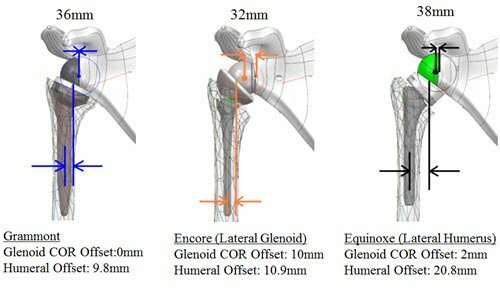 With these design modifications, a number of studies have reported superior outcomes with fracture-specific humeral stems compared with conventional humeral stems for proximal humerus fractures. Krishnan et al  reported better functional outcomes and associated tuberosity healing with the use of a fracture stem. Boileau et al  reported similar findings, as well as decreased complication rates, when a fracture stem was instead of a conventional stem in treating proximal humerus fractures. The humeral component in RSA has not received as much attention as the glenoid. This is probably appropriate, as the glenoid has provided greater challenges. Standard humeral implants can address a spectrum of bony deformity and proximal humeral bone loss. The use of cement fixation, while initially thought to be a necessity, no longer appears to be “absolute.” There is evidence showing that press-fit or cementless fixation can be quite successful as long as good cortical contact is achieved. Revision of the humeral component needs to be individualized with respect to the indications for bone grafting and cement fixation. In addition, it is important to understand the different implant designs available to individualize the treatment of each specific patient. This is particularly true in preoperative planning for revision RSA. 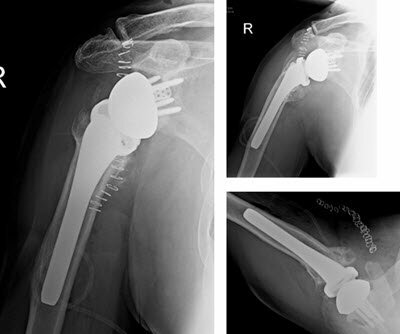 In dealing with the humeral side during RSA, bony deformity and deficiency, nuances inherent to each implant design, and method of fixation should be taken into account to optimize the outcomes of reconstruction. Boileau P, Trojani C, Walch G, Krishnan SG, Romeo AA an Sinnerton R. Shoulder arthroplasty for the treatment of the sequelae of fractures of the proximal humerus. (2001). JSES 10(4): 299-308. Onstott, E et al. Consequences of concomitant subscapularis repair with reverse total shoulder arthroplasty. Trans of the 58th Annual ORS Meeting, 2012. Antuna SA, Sperling JW, Sánchez-Sotelo J, Cofield RH. Shoulder arthroplasty for proximal humeral nonunions. (2002). JSES. 1(2):114-21. Martinez AA, Carlos B, Ignacio C, Daniel I, Jorge GA, Antonio H. The treatment of proximal humerus nonunions in older patients with the reverse shoulder arthroplasty. (2011). Injury, Int J Care Injury. JINJ 4899: 1-4. Greiner S, Uschok S, Herrman S, Gwinner C, Perka C and Scheubel M. The metaphyseal bone defect predicts out come in reverse shoulder arthroplasty for proximal humerus fracture. (2014). Arch Orthop Trauma Surg. June 134(6): 755-64. Cuff D, Levy JC, Gutierrez S and Frankle MA. Torsional stability of modular and non-modular reverse shoulder humeral components in a proximal humerus bone loss model. (2011). JSES 20: 646-651. Halstead JC, Deo S and Carr A. Impaction bone grafting for revision of a humeral component: Successful clinical and radiological outcome. (2000). JSES 9(5):449-451. Budge MD, Moravek JE, Zimel MN, Nolan EM, Wiater JM. 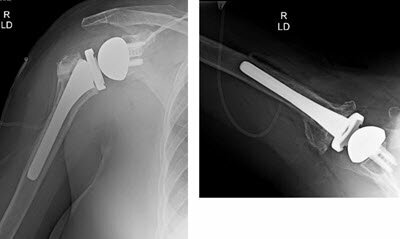 Reverse total shoulder arthroplasty for the management of failed shoulder arthroplasty with proximal humeral bone loss: is allograft augmentation necessary? (2013). JSES. 22(6): 739-44. Van de Sande MAJ, Dijkstra PDS and Taminiau AHM. Proximal humeral reconstruction after tumor resection: biological versus endoprosthetic reconstruction. (2011). Int Orthop SICOT. 35:1375-1380. Wiater BP, Moravek J, Pinkas D, Budge M, Koueiter D, Marcantonio D and Wiater JM. Uncemented versus cemented reverse total shoulder arthroplasty. (2013). Orthop Proceedings. 95B: Supp 9(34):482. Chalmers PN, Slikker W 3rd, Mall NA, Gupta AK, Rahman Z, Enriquez D, Nicholson GP. 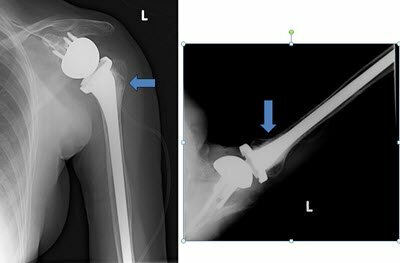 Reverse total shoulder arthroplasty for acute proximal humeral fracture: comparison to open reduction-internal fixation and hemiarthroplasty. JSES. (2014). Feb;23(2):197-204. Badman B and Levy, Jonathan. Reverse shoulder prosthesis for acute four-part fracture. Techniques in Shoulder and Elbow Surgery. (2009). 10(2): 76-82. Levy JC, Badman B. Reverse shoulder prosthesis for acute four-part fracture: tuberosity fixation using a horseshoe graft. JOT. (2011). May;25(5):318-24. Krishnan SG, Reineck JR, Bennion PD, Feher L, Burkhead WZ Jr. 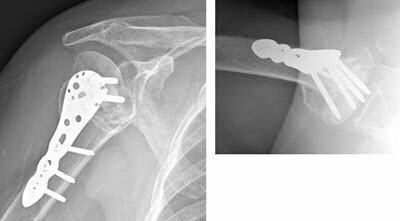 Shoulder arthroplasty for fracture: does a fracture-specific stem make a difference? CORR. (2011)Dec; 469(12):3317-23. Boileau P, Winter M, Cikes A, Han Y, Carles M, Walch G, Schwartz DG. Can surgeons predict what makes a good hemiarthroplasty for fracture? JSES. (2013). Nov;22(11):1495-506.